While I am generally loathe to quote other media sources, reports on both the Foreign Policy and Airwars websites show how the United States has potentially added to the already significant problems facing Syrians who have remained in their war-torn homeland. The A-10 is equipped with a 30 mm gun, giving it significant and precise firepower, resulting in lower collateral damage. According to the U.S. Department of Defense, the A-10's arrived at the Incirlik base in Turkey on October 18th, just after the Turkish government opened up the base to "strike assets". Most of the operations from the base are over Syrian territory and are used to provide air support for the Syrian Democratic Forces (i.e the anti-Assad forces) in the northeastern part of the country. A fully loaded A-10 has the capacity to carry 2000 pound and 500 pound joint direct attack munitions or JDAMs, laser-guided JDAMs, the AGM-55 Marverick air-to-ground tactical missile and the aforementioned 30 millimetre GAU-8/A Avenger gun with 1150 rounds of ammunition. The gun is a hydraulically driven seven-barrels Gatling-type auto-cannon that is so accurate that it is not guided by lasers or Global Positioning System signals. 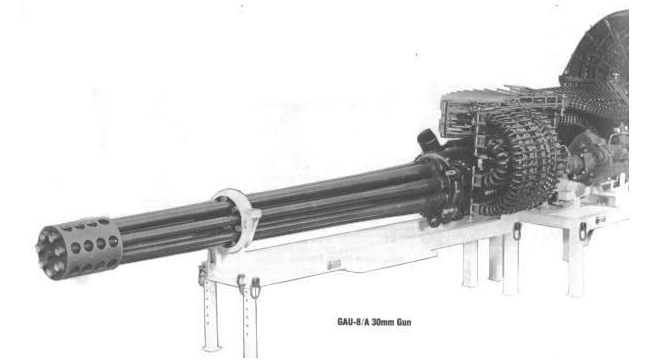 At its high rate, the GAU-8 fires 3900 rounds of mixed high explosive incendiary and armour piercing incendiary ammunition per minute with a maximum range over over 1250 metres and a muzzle velocity of 1067 metres per second. With that background, let's go back to the news posted by both Foreign Policy and Airwares. 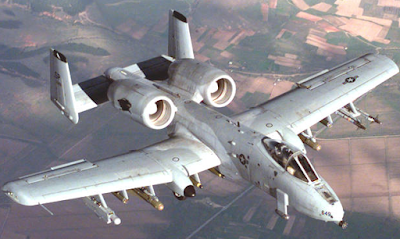 While use of the awesome power of the A-10's Gatling gun is not surprising, what is surprising is that the Air Force is admitting that they used 5265 rounds of armour-piercing rounds that contained depleted uranium on the dates in question, similar ammunition to that which was used during Operation Desert Storm. Back then, the Airforce used Armour Piercing Incendiary munitions with a depleted uranium (DU) penetrator slug because these munitions were particularly effective at countering armour-plated Iraqi tanks. The 148 A-10s used during Operation Desert Storm flew 8077 combat sorties, firing a total of 783,514 rounds of Armour Piercing Incendiary munitions, leaving a total of 249 tons of DU in the region. 1.) inhalation - the most likely route of intake when the depleted uranium is re-suspended in the atmosphere by wind or other forms of disturbance. 2.) ingestion - from drinking water or food. 3.) dermal contact - only a risk when it enters the system through an open wound or from embedded fragments. 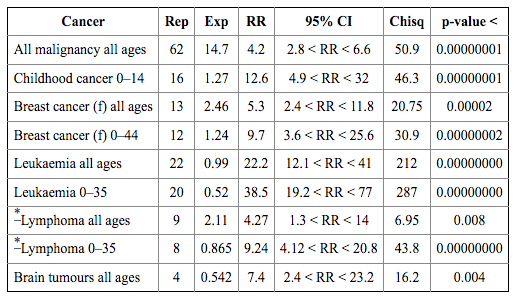 As you can see, the reported incidences of cancer are far higher than what would normally be expected. 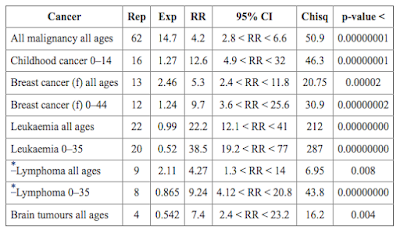 While the authors do not draw a direct link between the use of depleted uranium munitions and the significant increase in the occurrence of cancers in the Fallujah region, at the very least, the coincidence is rather interesting. "6.5.7 Depleted Uranium Munitions. Depleted uranium (DU) is used in some munitions because its density and physical properties create a particularly effective penetrating combination to defeat enemy armored vehicles, including tanks."